To Celebrate their 35th year anniversary and the 30th anniversary of legendary album Darkness Descends, DARK ANGEL will play Darkness Descends in its entirety in Vancouver, Canada, October 8th 2016! 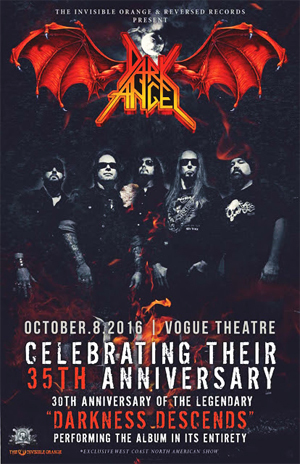 The show will mark the first DARK ANGEL appearance in Canada since 1989 and an exclusive West Coast appearance in North America for 2016. Tickets go on sale Friday, April 8th. DARK ANGEL will also include songs from Time Does Not Heal for the 25th anniversary of this classic album. DARK ANGEL limited edition colour vinyl of the first release, We Have Arrived, will be available at the show and will be a part of the premium VIP packages signed by DARK ANGEL.